We began our journey with a stop in Belleville at the Boyer Museum of Animated Carvings. I had previewed some of the works of Paul Boyer in the 8 Wonders of Kansas book, where the museum is listed as a finalist, but I was not prepared to experience the mechanical genius or the compelling personal journey behind Mr. Boyer’s work. Collections of gears, endless lengths of wire, springs and baubles mysteriously set scenes in motion. Intricately carved wooden figurines brought to life with the touch of a button. One of my sons stood transfixed by small metal balls bouncing through a series of orchestrated, intricate patterns. The other son questioned our tour guide (Paul Boyer’s daughter) about the inner workings of a handmade calliope. I can’t think of another way to say this: My children are typically curious travelers, but it isn’t often that I have to literally drag them away from a museum. Further along in our itinerary, we visited the small town of Lucas, the Grassroots Arts Capital of Kansas. 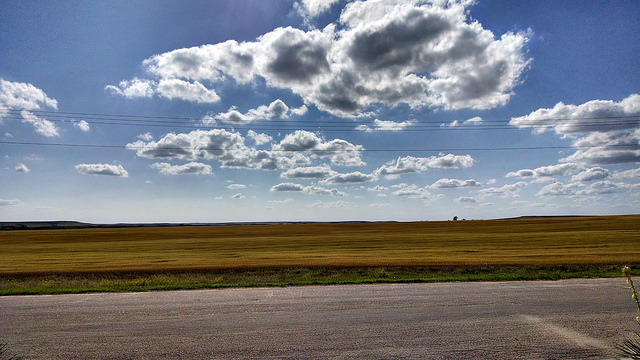 Our first thrill after leaving the interstate toward Lucas was a breathtaking view of Wilson Lake. Touted as the clearest lake in Kansas, the surrounding hills and valleys and the green hues of spring offered spectacular contrast with the crystal-blue water. Our first stop in Lucas was the home of Samuel P. Dinsmoor, more commonly known as the Garden of Eden. Inspired by strong Populist beliefs and unconventional religious convictions, the eccentric Dinsmoor created a collection of over 200 large concrete sculptures winding above and around his limestone cabin. Among the statues – each with its own story to tell about Dinsmoor’s world views – he built his mausoleum. Reluctantly, I followed our guide inside to take a peek and, admittedly, it was a strange experience. But it wasn’t my view of Dinsmoor’s visage that made it onto the postcards home. I’ll remember the Garden of Eden best for its personality – the resourcefulness of its architect, the beautiful design elements and innovative techniques. The spirit of Dinsmoor lives on through the creative character of the community, and it’s apparent even in the public restrooms. It just so happened that my son was having a bit of an emergency as we left the Garden of Eden. Our tour guide simply directed us downtown. “Go straight,” she said. “You’ll see it.” In fact, you can’t miss it. Shaped like a giant toilet complete with a winding roll of paper, the Bowl Plaza public restroom was built to serve Lucas’ 10,000 annual guests. At different times along this journey, my boys and I dreamed up art projects together, sketching our thoughts on napkins and maps. And our story offers just a glimpse into the inspiration and adventure that this Northern Central Prairie itinerary offers. Don’t miss reading about other Yellow Brick Road Trip adventures at TravelKS.com.